Wouldn't it be great to pick your own fresh fruit from a farm in the Lake Winnipesaukee area in New Hampshire and eat it fresh that day? Or perhaps bake some pies? Or even cut your own tree? Well, you can! Freshly eaten berries or apples are so tasty and delightful and can be found right here in the Lake Winnipesaukee area of New Hampshire. It's a fun activity to do with the kids too! For those that want to buy freshly picked fruit or vegetables can try out the local New Hampshire farmer's markets around Lake Winnipesaukee in the summer. There you will be able to find all kinds of fruits and vegetables to enjoy for snacks and summertime meals. The season around Lake Winnipesaukee in New Hampshire starts off with pick your own strawberries. These tasty, sweet berries can make your mouth water. Some places offer you containers to pick, but you can bring your own bucket. Strawberry picking goes from late June to mid July. It seems, the earlier you go, the larger the berries. Sometimes you pick your own based on the weather. I prefer to go early in the morning - it's cooler. Kids can be great little helpers too. Give them their own bucket and off they go. 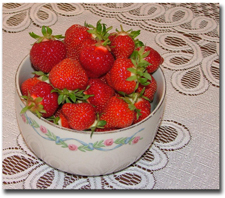 Children tend to put more strawberries in their mouth than in their bucket. That's okay. It's good for them. As an update: Some of the farms have stopped the pick your own strawberries. The people at Smith Farm have retired, but still do raspberries. Greens and Beans may start strawberry picking again. Please call ahead to double check. Right after strawberry season, it's raspberry season. These berries tend to be more expensive, but they sure are tasty. Raspberry bushes are tall, so you don't have to bend over to pick your own. Raspberries are also easy to grow. My backyard is loaded with them. But you need to be careful because they spread and start to take over the yard! Pick your own blueberries is yet another fun activity to do in the summer. Blueberry picking is usually in early to mid August. There are domestic and wild blueberries. 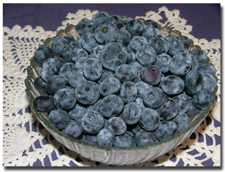 The domestic blueberries are larger and you generally pick them at local farms. You can also go hiking and pick wild blueberries along the way. No matter which variety you pick, you sure can make some scrumptious treats. I just found a place where you can pick your own cherries and peaches! Usually, you can find a place to pick all the other fruit but never cherries and peaches. Check out Butternut Farm in Farmington, New Hampshire. 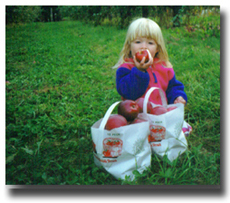 They are family oriented, offer top quality fruit, great New England atmosphere and easy picking conditions. I plan on checking them out this summer. Black raspberries are also great for picking. They tend to ripen at the end of August or beginning of September. So far, I've only found them growing wild. If I ever find a local place in the Lake Winnipesaukee area to pick them, I'll let you know. In the fall, there's apple picking. A lot of schools do field trips to apple orchards. This is a great activity for the whole family. At the same time you pick your own apples, you can enjoy the fall foliage! What a great way to have a fun day in the Lake Winnipesaukee area! Don't forget the pumpkin picking! Actually, you just pick from a crop that the farm stand workers have already picked. It's fun to go to a local farm stand with the kids to get a pumpkin. Some of them have other activities as well. Such as hay mazes, corn mazes, animals, hayrides and more. Beans and Greens in Gilford, New Hampshire has a number of activities in the fall. Beans and Greens has a corn maze that is fun to go through during the day with the young kids. At night, it's a little more challenging and "spookier" for the older ones. Butternut Farm in Farmington, New Hampshire also has pumpkin picking. Plus you can find homemade pies and other specialty items. They are open from mid-June to early November from Tuesday through Sunday from 8am-4pm. Now we've come to Christmas trees! Is it Christmastime already? Many families go out and pick your own Christmas tree. It's a family tradition that everyone can enjoy. Whether you want to cut your own or have someone cut a tree for you, Christmas tree farms can bring the whole family together in the Lake Winnipesaukee area. If you want to save money and you own land, you can cut your own tree for free. We did that for a few years. The first one was a Charlie Brown tree. They got better each year after that. It's hard to find a small, full tree to fit in your house. Sometimes you need a larger tree and just use the top part of it as the Christmas tree. There are so many places to pick fresh fruit, pumpkins and even Christmas trees in the Lake Winnipesaukee area of New Hampshire. I know it's easier to get it at a store, but the freshly picked strawberries, blueberries, raspberries and apples taste so much better that you'll wonder why you didn't do this earlier.